This review of Ego SolvEasy Tinea Cream for Athlete’s Foot is to help prospective customers learn the pros and the cons of buying this product and making a wise decision when it comes to using it. 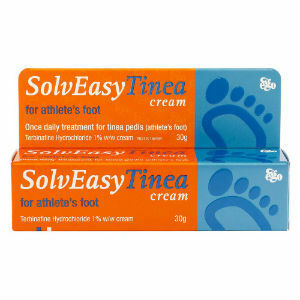 Ego SolvEasy Tinea Cream for Athlete’s Foot is used to treat athlete’s foot by binding itself to the affected area and treating it for days after one has applied the cream. The product is not available on its website but is available on other shopping websites. Read on to know more about how the product is used as well as if its good enough to be used to treat the infection. The active ingredient is Terbinafine Hydrochloride 1% and the preservatives used are: benzyl alcohol and hydroxybenzoate. One should clean and dry the affected area thoroughly. For a total of seven days one should use this cream on the area that is affected as well as use it on the surrounding areas. It is recommended not use soap on the affected aread as long as the treatment is on-going. One should use this treatment for two to four weeks if the sole of the foot has been infected. After the treatment has been finished it is unlikely that the infection will reoccur. One should seek medical advice if they pregnancy or breastfeeding, before using this cream. If irritation develops, contact your pharmacist or doctor. The prices are not available on the product’s website and have been taken from the leading online shopping websites. There is no guarantee provided by the manufacturer of the product but there is a customer care number that has been provided on the product’s website if the customers have issues or need to find out more regarding the product. There are customer reviews on the product’s website as well as on other shopping websites which testify that the product is a good one and extremely effective. Ego SolvEasy Tinea Cream for Athlete’s Foot is a viable product if one goes by the positive customer reviews that are available. The directions on how to use the product as well as the ingredients that are used in this product have been stated clearly on the website and make it easier for the customer to make an informed decision. However it does not have any manufacturer’s guarantee but the customer care number has been provided to address any grievances related to the product and makes this product a viable one. Pregnant women are advised to consult a doctor before using this product. Jimmy Rodriguez	reviewed Ego SolvEasy Tinea Cream for Athlete’s Foot	on November 19th	 and gave it a rating of 2.5.